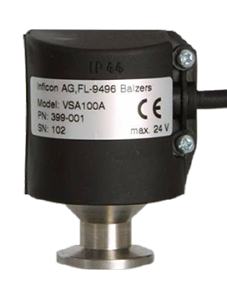 The INFICON Vacuum Switch VSA100A is used as a safety switch in vacuum systems. For example, to automatically interrupt the gas supply when venting vacuum systems with a purge gas at a pressure of 6 mbar below atmospheric pressure. At a differential pressure of 6 mbar resp. return switching pressure of 3 mbar below atmospheric pressure, an elastic diaphragm actuates a changeover contact which in turn may be used to switch directly any ancillary equipment.